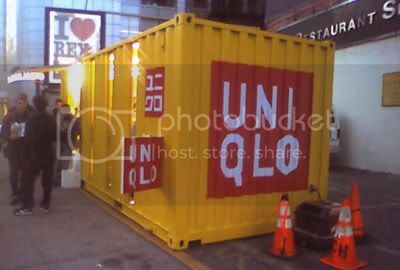 (There's a) new way of recycling shipping containers for use in construction. It’s a pretty cool innovation in green building: recycling unused shipping containers and using them as high-end condos, office buildings, low-income housing, or even relief shelters. 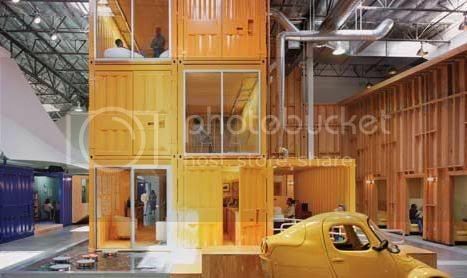 Click "Read More" to view more fantastic container van transformations. Most of us have seen a tower of shipping containers at least once in our life. Throughout the US there are over 700,000 abandoned shipping containers. As the US moves away from being a manufacturing economy, we receive many more of these containers than we use to export goods, creating a surplus of containers that, well, don’t contain anything. Reusing them for importing more goods is inefficient, since it’s usually less expensive to manufacture a new container than to reuse an old one. Thus we are left with man-made mountains of empty steel boxes sitting in shipyards across the United States. As the world scrambles for ways to become greener, people are looking for ideas for recycling these old containers, and putting them to some good use. With the help of some creative entrepreneurs and architects, these cocoons of the industrial age are undergoing a metamorphosis into portable stores, emergency housing, and luxury homes. These containers allow for innovation in construction, as well as an efficient and environmentally friendly way of building our new homes and businesses. 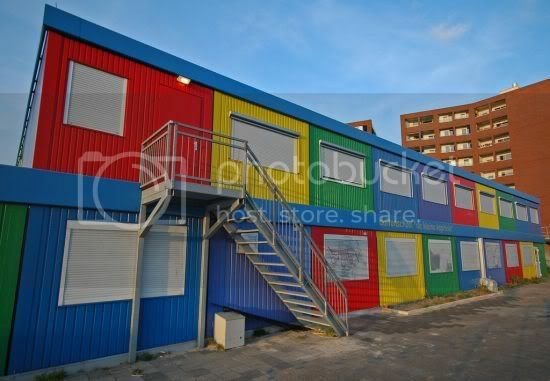 The most popular type of shipping container construction is modular construction. Modular construction involves pre-fabricating the containers at a site, then shipping them to the end location to be assembled. 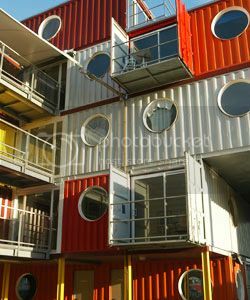 This sort of construction allows for single containers to be fabricated as small homes or offices and be delivered as is, or alternatively to be constructed as a series of connecting parts. Simply choose the size and floor plan for your new building and the required containers are assembled together. It’s like the IKEA version of home building. From two story homes, to schools, to extremely affordable apartment buildings, shipping containers allow for quick construction and additions. 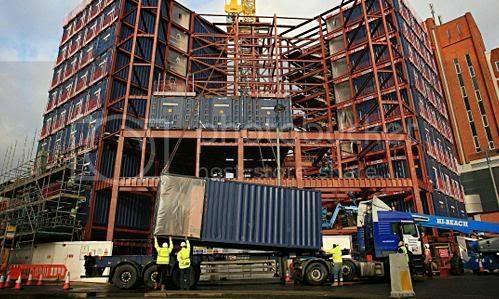 Because they are already designed to be stackable, very little modification and preparation is needed to add new floors to existing container structures. Container City, one of the most successful modular shipping container construction firms in the world, was able to install a fourth floor to Container City 1 in less than 48 hours. 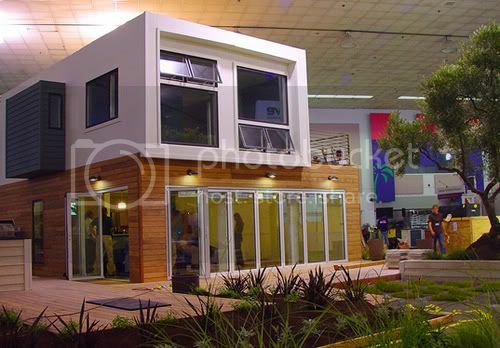 People are also looking to shipping containers to solve problems of world housing. Millions of people around the world live in what are considered “sub-standard” living conditions. Pablo Nava recently won Notre Dame University’s Social Venture Plan competition and received funds to start a business that will convert these shipping containers into single family homes, with the goal being a final price tag of $8000. Mr. Nava’s company Por Fin Nuestra Casa (Finally, a home of our own), is a for-profit company because of the belief that this will further promote its success. Not only is shipping container construction incredibly environmentally friendly, it can also be used for emergency relief. In disaster relief or refugee situations, shipping containers can be modified to be emergency housing. Future Shack has modified a container to be a fully self contained disaster housing that can be deployed in less than 24 hours. The construction includes solar panel cells to power the unit, bathroom, and a fold-away bed and desk. While it’s currently only in the prototype phase, the incredibly durable container could be reused around the world for up to 25 years, giving shelter relief to dozens of people during its lifespan. Shipping container construction is the new craze in modern architecture. 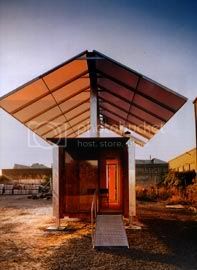 They can allow for buildings made out of up to 80% recycled materials. More importantly they allow contractors to return to their childhood dream of building with legos. However, this does beg the question: how do you ship shipping containers?